After Jordan Zimmermann threw a no-hitter in one of, if not, the fastest Major League Baseball games I have ever attended (just over two hours), I decided I wanted to stick around Nationals Park a little longer. Since playoff tickets were so expensive, I knew this was most likely the last time I would be at the Park for the 2014 season. Therefore, I wanted to make the most of the opportunity. Upon exiting the stadium I made my way over behind the first base gate to the players’ lot. I knew I’d have to wait a little while before anyone started emerging, but I definitely didn’t plan on being there as long as I was. However, just like the game which had taken place, this would turn into another unforgettable experience. I leaned against the gate which provided space for the cars to exit the stadium and which kept fans contained. 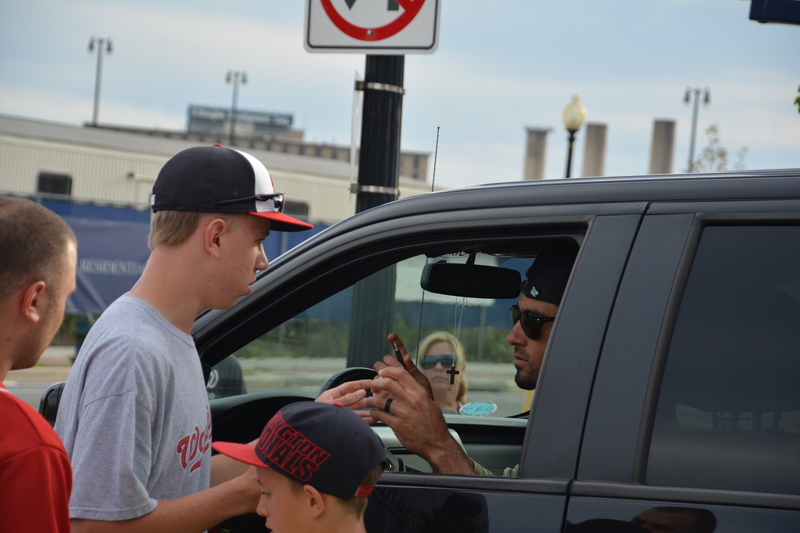 There was a solid number of us there when the first significant member of the Nationals organization stopped the car he was driving to greet fans. Significant, though, may be an understatement; it was General Manager Mike Rizzo. A line for autographs quickly formed and I was sure to get my place. 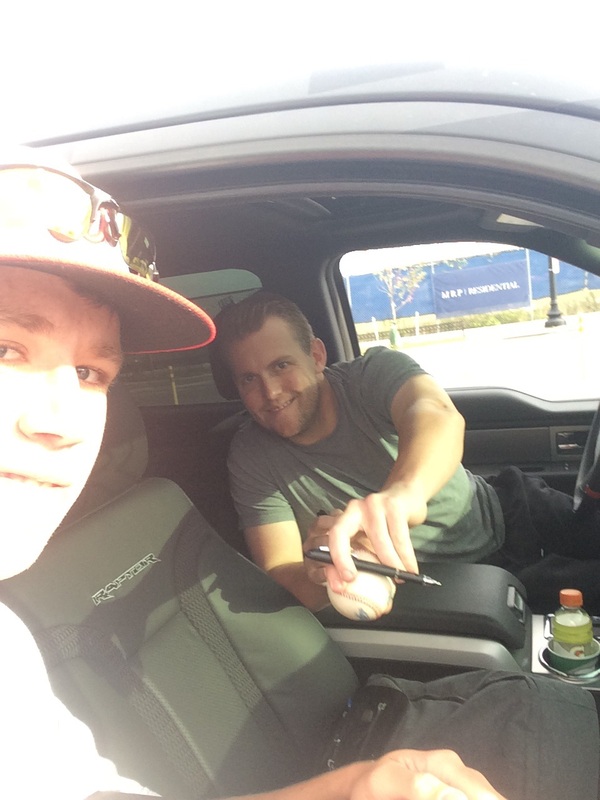 Before long I was at his window, and after he signed my Inside-Pitch program, I made sure to get a picture. Rizzo departed and it was time for the next National to stop for the crowd. This time it was Drew Storen, the pitcher whose career has come under-fire since his inability to close Game 5 of the 2012 NLDS. However, I was happy to get in line and get another autograph and picture. Next to leave was utilityman Scott Hairston. Once again, a line quickly formed, but this time I would not be in luck. The person in front of me was the last autograph he signed before cutting off the line, and he didn’t even look for a good picture. Still, I gave it a good attempt. After Hairston came my favorite National. Ian Desmond’s work on and off the field has put him in a special place in the hearts of many Nats fans. 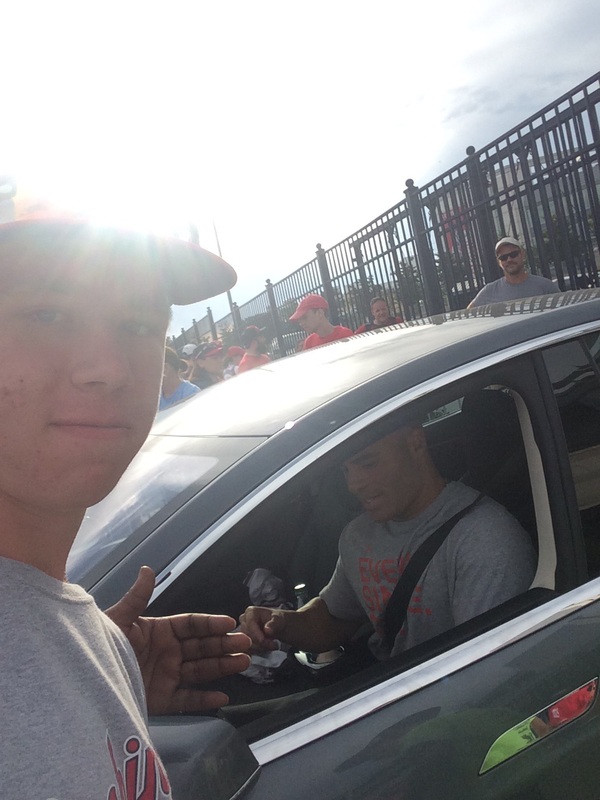 He’s the reason I wear number 20, and I was especially excited when he also stopped to sign autographs. While he preferred I not take a selfie with him, my mom, standing a few feet away, got an awesome picture of our exchange. 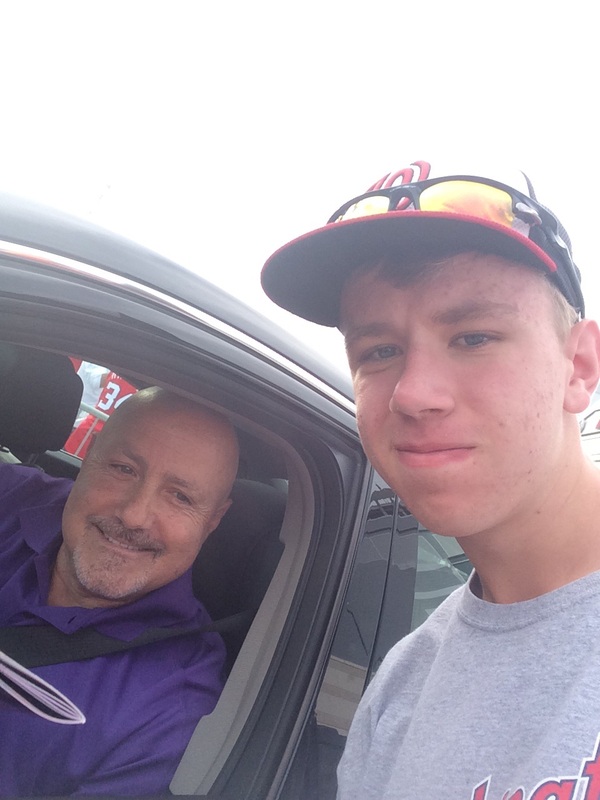 Desmond drove away, and it was time for one of the most important members of the Nats to make an appearance. It was not a player, it was manager Matt Williams. He stepped to the side and signed autographs for the long line of fans. I did not hesitate, and took my place to acquire yet another picture and autograph. My mom snapped a picture while I was taking the selfie of my own…a little pic-ception (click the pictures to view as a gallery). After Williams, I encountered two more people of note. The first was play-by-play man Dave Jageler, the broadcaster Steve and I interviewed on our podcast back in May. I did not take a picture with him, I just wanted to make my way over and say hi. There were others in front of me talking to him, and I lingered in the back waiting my turn. Then he saw me peeking over the small crowd and said, “Hey Paul,” which was significant to me. Over the course of the season you run into a lot of people and talk such a large number of fans, so for him to remember my name and pick me out was special. Granted I did tweet him several times since our interview, and my profile picture has remained that of me and him, so it may not have been all that difficult. However, still cool nonetheless. When I got my chance to talk to him, he asked me if I was at the stadium to receive a bobblehead the night before, a reference to my waiting in line for the Jayson Werth Garden Gnome in August. I told him we chose to go to this game instead of last night, and he remarked that you can buy a bobblehead on eBay but you can’t exactly do the same for a no-hitter. After the exchange, Jageler departed, and it was time to see one more National before heading out myself. The man who caught the first no-hitter in Nationals history, Wilson Ramos, made conversation with the crowd. By this time, it was over an hour and a half since the last out of the game had been recorded, so there weren’t all that many people left. When I saw Ramos, I made sure to get a picture. Last season, he played in a rehab game at Potomac, but the picture I got with him after that game was fuzzy. I needed a better one, and a better one I took. All in all, it was such a memorable day. From seeing the first no-hitter in Nationals history, to interacting with the players after the game; it was an experience I will take with me for as long as I can remember. To conclude, here is another gallery containing the pictures. As always, click on one to be able to go through them more easily.